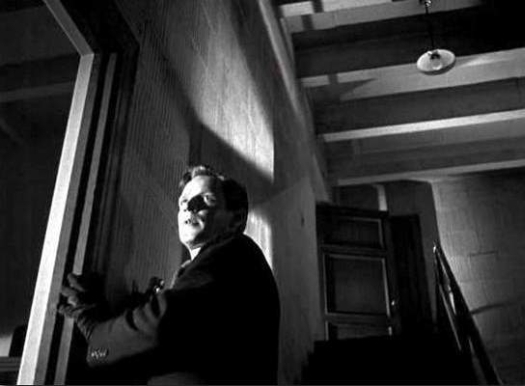 Last week I recommended The Naked City, one of the many crime investigation procedurals that became popular after World War II and continue to be a staple of television and movies today. This week’s recommendation opened in theaters a few months after The Naked City, but is markedly different than that film because of its pronounced noir elements: He Walked by Night. Normally, police detectives have substantial advantages over perpetrators. The typical violent offender is unintelligent, impulsive, minimally-skilled and ignorant of police procedures. But every once in awhile a criminal comes along who is smart, planful, technically proficient and knowledgeable about the investigative methods of law enforcement. One of such extraordinarily dangerous people was Erwin M. Walker, who repeatedly evaded Los Angeles law enforcement while engaging in an extended violent crime spree in 1946. He Walked by Night is a Dragnet-style dramatization of the Walker case, and indeed the origins of that famous radio and TV show are right here to see. Richard Basehart gives an icily compelling portrayal of Walker, who is here re-named Roy Morgan. Basehart is particularly skilled at embodying Morgan’s disturbing level of emotional restraint, even when he is inflicting violence on others. The only visible break in the killer’s sociopathic detachment comes in a riveting scene in which he does meatball surgery on himself to remove a bullet from his ribcage. On the other side, Roy Roberts, as Police Captain Breen, is credible as usual in one of his many no-nonsense authority figure roles. Some of the portrayals of police procedure (e.g., the assembling of a composite sketch) will be dramatically slow for modern audiences who have seen it all before. But of course that wasn’t true of audiences in 1948, so be forgiving. The docudrama’s look is one of the many jewels in legendary cinematographer John Alton’s crown. In an interview, he said the crew and director all asked him where the lights were when they started filming the justly famous chase through the sewers. He told them that a single flashlight was enough, which gives you an idea of how very dark he preferred his shots. 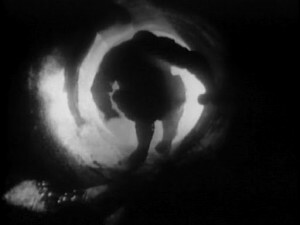 If you watch very carefully you will see that the king of darkness did have a trick up his sleeve: There are wires visibly trailing the actors in some of the sewer chase shots, indicating that he rigged the flashlights with much more powerful than usual light bulbs. In addition to Alton’s bravura work behind the camera, this film also benefits from effective use of silence. In several highly arresting sequences (no pun intended), the sound goes dead as the police close in on the killer. The suspense is amped up enormously by these eerie scenes, as hunter and prey creep noiselessly through the dark until a violent confrontation shatters the silence. The one mystery this film does not solve is who directed what. Alfred Werker got the director’s credit on screen, but it was later revealed that much of the film was actually directed by Anthony Mann (whose work I have previously touted here and here). Some scenes scream “Mann” in their style but others could have been directed by either him or Werker. Whoever did what, this taut, exciting film hangs together in tone and style with no directorial seams showing. He Walked by Night is sadly little remembered today, but it did launch some much better known radio and television shows. Jack Webb, who plays a police investigator here, befriended L.A. police technical advisor Marty Wynn on the set and soon launched Dragnet to dramatize the real-life cases of the L.A.P.D. (FYI: This story is well-told in John Buntin’s terrific book L.A. Noir). Richard Basehart never became a big movie star, but was able to parlay his modest cinema success into a long-running career on television, most notably as Admiral Nelson on Voyage to the Bottom of the Sea. This thrilling, visually stunning docudrama is in the public domain, so I am posting it right here for you to enjoy. p.s. The fabulous sewer chase sequence in one of the greatest films in British history, 1948’s The Third Man bears more than a little resemblance to the similar sequence in He Walked by Night. No one seems to know for sure, but given that He Walked by Night’s production studio, Eagle-Lion films, had extensive British ties it is entirely possible that Carol Reed et al saw this movie and decided to mount something along the same lines. This is a great film. While Richard Basehart may never have achieved real star status, he had quite a respectable career. And cinephiles of a certain age will never forget his electric, charismatic performance in Fellini's classic "La Strada"
re Voyage to the Bottom of the Sea: "bibliophiles" of a certain age will never forget the excellent parody in Mad magazine called Voyage to See What's On the Bottom.